Buying the new iPhone XR? You'll need a case to keep it safe. Read the article below to find out what makes these cases stand out and to see our other favorites. It might be the more affordable option, but it’s still a significant expense, so you’re going to want a case to protect it. Fortunately, there are some very nice case options to choose from. We rounded up our top picks to help you decide. We’ll add more to the list as new cases become available, so watch this space. 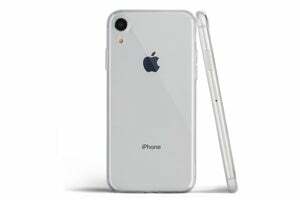 The iPhone XR’s six different colors distinguish this smartphone from its siblings. The best way to show them off is a clear iPhone case. Highlights: Casetify is known for its transparent cases with beautiful and unique graphics. 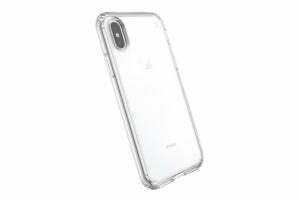 But Casetify’s less expensive Grip Case also comes in a completely clear version to show off your chosen iPhone XR color. Despite not being the company’s military-grade Impact Case, the Grip Case is still very sturdy and can handle drops from up to 4 feet. The Grip Case comes with three different border colors as well, to accent your phone. Casetify only provides a 6-month warranty, but shipping is included on orders more than $35. Highlights: OtterBox was one of the first to popularize rugged, protective cases for iPhones, and it’s still in the biz 20 years later. The company’s classic Symmetry Series comes in many colors, including clear and even a glittery clear version. 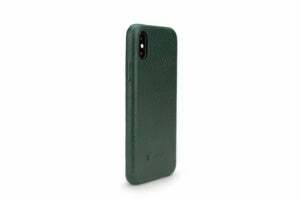 What makes this OtterBox great is how snugly it fits and how its thick armor makes you feel your iPhone XR is safe. Amazon includes shipping on this order since it comes to over $25, and OtterBox will still provide its famous Drop Protection Guarantee. 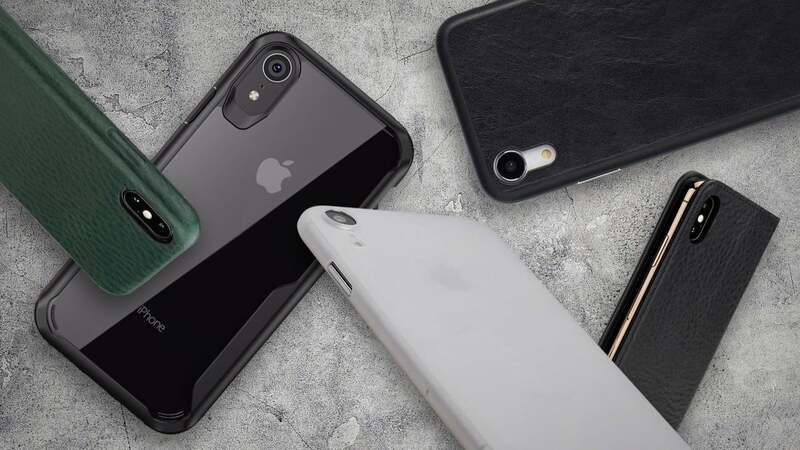 Highlights: Speck’s Presidio Stay Clear case is perfect for showing off the six different colors the iPhone XR comes in. 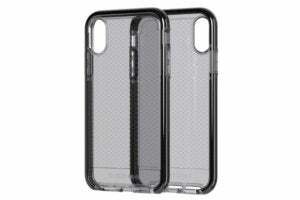 The case has two layers of protection and a raised bezel, which is meant to protect your phone from drops up to 8 feet. It also claims to absorb UV rays and oil to prevent smudging. To the touch, the case is unflexing and incredibly tough. The iPhone XR, XS, and XS Max all sport ultra-durable Corning Gorilla Glass 6, but you can never be too careful. 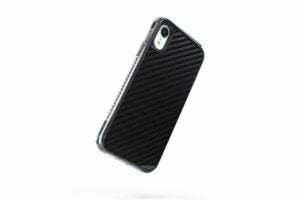 These protective iPhone cases will provide the shielding you need. Highlights: The semi-transparent Evo Check is surprisingly durable while being very flexible and even soft to the touch. Tech21 promises “scientifically proven” 12-foot drop protection in part thanks to the air pockets lining the case. Bezels at the bottom of the are also raised a little higher than most cases to protect the speakers and Lightning port. Buttons are also very firm and responsive. The brand name’s imprint on the interior back of the case feels a bit like sandpaper, but not enough so to harm the iPhone XR’s body. Tech21 provides a limited lifetime warranty and includes 2 to 5 day shipping in the U.S. and Canada. Highlights: Unlike its textured grey marl cousin, the Flex Switch Carbon Fibre offers even more protection due to its sturdier materials. 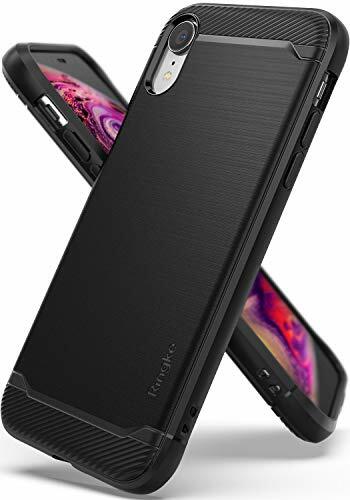 This uniquely styled case from Proporta has a shiny black back and a tough, unflexing body. The hardshell case is made from TPU gel and has an air shock wall with a charcoal TPE gel lining. It even has a subtle kickstand that swings out from the top of the case. The Flex Switch is sturdy in all the right areas, but flexible where buttons and ports are located. The air pockets lining its interior also provide extra shielding from drops. Proporta offers a lifetime warranty and ships to the U.S. for free within 5 to 7 working days. Highlights: Shiny, black, and snug. 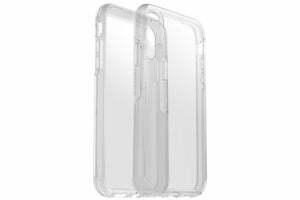 Ringke’s Onyx case is a great deal while offering impressive protection for a case that’s pretty slim. Its plastic, flexible, and has a pleasantly smooth, comfortable grip. The case boasts “advanced shock absorption” via Military Grade MIL-STD 810G - 516.6 drop protection, which protects the phone from drops of 4 to 6 feet depending on the surface. There are even a few notches in the bottom-left through where you can string a lanyard. The Ringke Onyx is available from Amazon and qualifies for free shipping. While not as big as the 6.5-inch iPhone XS Max, the iPhone XR is fairly large at 6.1 inches. 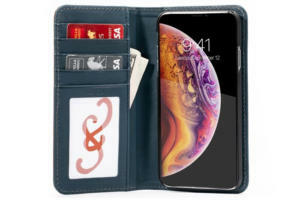 Wallet cases for this phone can definitely hold a good amount bills, cards, and papers. Highlights: The Polo Book isn’t your typical folio case. For one, its interior shell case magnetically detaches to create a 2-in-1 case—and the utility doesn’t stop there. Thanks to its magnets, you can adjust the hard shell case into a viewing stand. 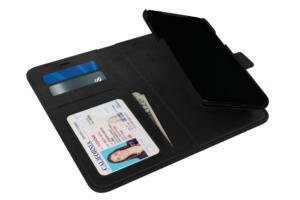 It also has a transparent card slot for your ID, three other slots for cards, and a pocket for storing bills and other papers. Though, we wish the corners of its hard shell case were a bit smoother and had less puckering. The Polo Book is available from Amazon for $39.99 in black and $49.99 for the other two colors, including shipping. It comes with a 1-year warranty. Highlights: With a phone as big as the iPhone XR, you might as well use it to store your bills. And with OtterBox’s reputation for sturdy cases, you’ll get some good protection as well. This Strada Folio Case is made from leather, claims to age well, has a horizontal inside slot for cash or cards, and a magnetic strap and metal latch for the front cover. Along with OtterBox’s Drop Protection Guarantee, you’ll also get free shipping on this order since it comes to over $25. Highlights: For 30 bucks, this case from Snakehive is a great deal for a product that looks and feels much more expensive. The treatment on the leather has a suede-like feel that makes it difficult to keep your hands away. The interior pockets are also very roomy and capable of holding plenty of papers, bills, and cards. You can even fold the case so it works as a kickstand for your iPhone XR’s large screen. Highlights: If you prefer wallet cases, there’s so much to love about Pad & Quill’s Bella Fino. The leather case feels incredibly lux and thicker and heavier than other wallet cases we’ve tried. It also closes with a satisfying magnetic snap and seems durable enough to last for years to come. You can even customize the case with your initials. Pad & Quill offers an impressive 25-year leather warranty, which is something we haven’t seen from any other case maker. Shipping is included for all orders in the United States. 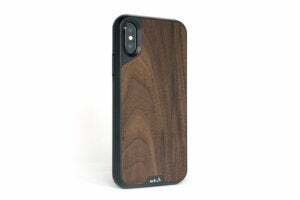 Wooden cases provide a lush feel and a unique look for the iPhone. 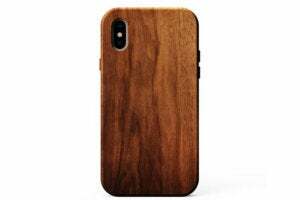 There are many wooden iPhone cases out there, but we chose some of the most premium offerings out there. When it comes to wood cases, the folks at KerfCase know their stuff. This one-piece case is almost entirely made of wood, down even to the buttons. What’s more, it has the added touch of a luxurious suede lining. But possibly its most impressive feature is how the case comes in 19 different kinds of wood, ranging from walnut to amboyna burl. The price varies depending on the rarity of the wood you select. Walnut is the cheapest at $69 while eucalyptus burl is the most expensive at $409. Yikes! All of the cases from Kerf Case are handmade in the U.S. and come with a lifetime warranty covering repairs. Shipping in the U.S. is included and should arrive within 2-4 business days via USPS. If you so desire, you can include your own engraving or image for an additional fee. 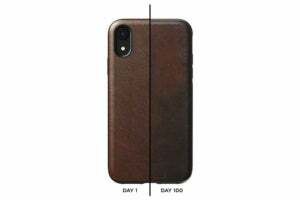 Highlights: Mous’s Limitless cases come in the same style but in a variety of prices depending on the material, including bamboo, leather, carbon fiber, walnut wood, and even shell. This particular case comes in either bamboo or walnut wood. What distinguishes Mous is not only how well made and sturdy the cases feel in your hand, but the rigorous testing methods the company uses: Slamming its cases with hammers, for exampl. Starting at $49.99, they are pretty affordable considering the eclectic materials. 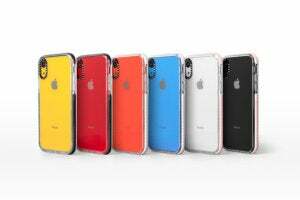 And the company’s AirShock technology promises the cases will deliver maximum protection. Mous offers free shipping on orders over $75 and a limited lifetime warranty. 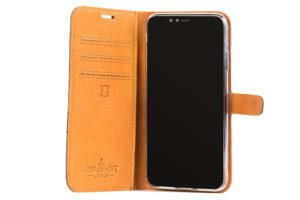 Leather cases add luxury and class to your iPhone. The material is also durable and shock absorbent. So if you aren't vegan, here are some great cases to consider. 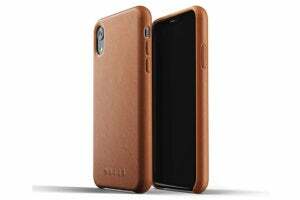 Highlights: If you’re looking for something cheaper but just as classy as Apple’s leather iPhone case, look no further than Dutch designer Mujjo. The company’s Full Leather Class exudes simple elegance with a textured grip that’s hard to keep your hands off. 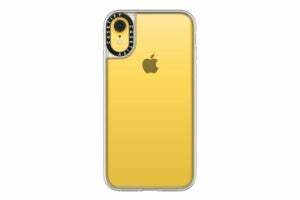 The case snaps incredibly snugly around the iPhone XR while covering the buttons subtly. Adding to its elegance, the case is lined with satin-like Japanese microfiber. Mujjo’s Full Leather Case is available from Amazon and includes shipping in the United States. Highlights: The Shell Case II from Nodus both looks and feels great. It’s made from full grain vegetable tanned Italian leather, delivering a perfect grip and nicely wrapping around the iPhone’s buttons. For added protection, its interior is a shock absorbent polycarbonate, though you’d never know it from the outside. One of its nifty features is a magnetic micro-dock that comes with the case. Use this to hang your iPhone from anywhere—even a wall. The Shell Case II is available from Nodus and includes shipping. Highlights: Nomad knows leather. The company’s Rugged Case takes a unique approach by using a material that develops a rustic “patina” over time. 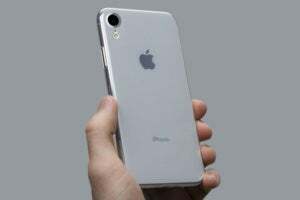 It’s also durable while being thin, with six-foot drop protection. 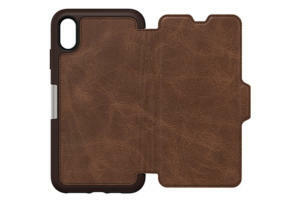 This is thanks to the case being made from a combination of Horween leather and polycarbonate. Overall, it feels incredibly well-made while having a handsome and sturdy look. Apple says the iPhone XR, XS, and XS Max are the most durable iPhones yet, and drop tests appear to prove this. 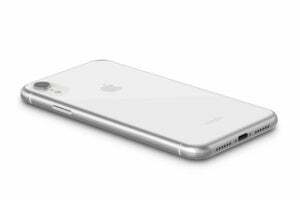 If you aren’t so worried about protection, you can just slip one of these ultra-thin cases on. Highlights: The 0.35-millimeter thin SuperSkin case from Moshi is nothing short of a miracle. You can barely tell the iPhone XR is wearing a case when it’s on. But we can’t guarantee this “naked” case will provide much protection outside of preventing scratches. It’s still unbelievable, though. All Moshi products have a 1-year warranty. The company also offers free 5 to 7 day shipping to the United States. Highlights: At 0.02 inches thin and 0.1 ounces light, this case from Totallee is among the thinnest and lightest you can buy right now. It may be simple in design, but it comes in a wide range of neutral colors in both matte and glossy finishes. The aesthetic is subdued but elegant and reasonably priced at $29. It also comes with a 2-year warranty and a 30-day money-back guarantee. Orders over $35 ship worldwide for free within one business day, so it might be worth buying two cases. If not, you can pay $4.99 for 2-5 business day shipping or $8.99 for 1-3 day express shipping. Highlights: Peel. Its very name describes how unimaginably thin this iPhone case is. Equally impressive is how tightly the case snaps to the iPhone’s form. You’ll find it hard to pry off once it’s on—the case is really like a second skin. Of course, this 0.35mm case only offers minor protection from light drops and scratches. Though, it does have a lip around the iPhone’s camera which should make you feel safer.